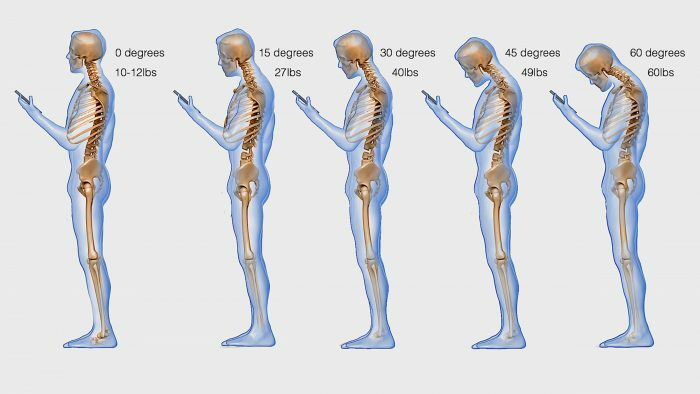 “In an X-ray, the neck typically curves backward, and what we’re seeing is that the curve is being reversed as people look down at their phones for hours each day. Lanman and study co-author Dr. Jason Cuellar, an orthopedic spine surgeon at Cedars-Sinai, say that people tend to look down at their phones more while texting than they do when they’re browsing the Internet or watching a video. 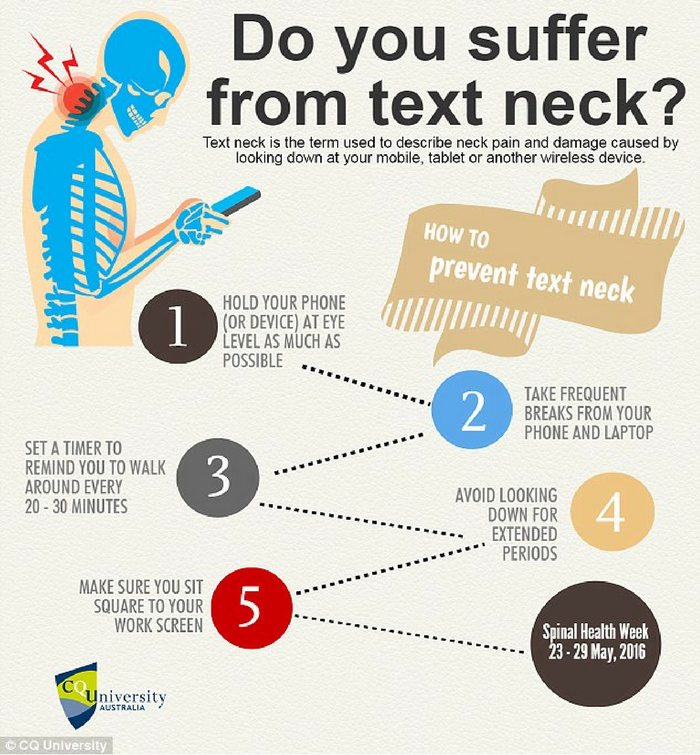 Many young people rely on texting as their sole means of communication, which means they crane their necks often for several hours a day. In earlier studies, researchers found that people hold their necks at about 45 degrees, and the curve gets worse as they sit, versus standing. The weight of your head changes, depending on what position you’re in – something you might have noticed but never actually connected with your neck and back problems. When you’re looking forward in a neutral position, your head weighs about 10-12 pounds. However, at a 15-degree flex, it feels like 27 pounds. The stress on the spine increases by degree, and at 60 degrees, it’s 60 pounds. That’s one heavy noggin. If you’re a laptop user, you can alleviate the problem by using a separate keyboard and mouse so that the laptop can be at eye level and you can sit in an ergonomically-correct position. Some of the stretches and exercises Lanman recommends involve lying on your bed and hanging your head over the edge while extending your neck backward, thus restoring the normal arc in your neck. He also recommends aligning the neck and spine by making sure that your ears are over your shoulders, and your shoulders are over your hips.